Here is one that is forgotten often in fast-paced, high-production environments: system. This at first glance cryptic criterion refers to terms that may not be part of our text or our list of term candidates, but that are part of the conceptual system that makes up the subject matter we are working in. And sometimes, if not to say almost always, it pays off to be systematic. A very quick excursion into the theory of terminology management: We distinguish between ad-hoc and systematic terminology work. When we work ad-hoc, we don’t care about the surrounding concepts or terms; we focus on solving the terminological problem at hand; for example: I need to know what forecasting is and what it is called in Finnish. When we take a systematic approach, we go deeper into understanding a particular subject. We may start out researching one term (e.g. forecasting) and understand the concept behind it, but then we continue to study its parent, sibling and child concepts; we work in a subject area and examine and document the relationships of the concepts. In the following example, the terminologist decided to not only set up an entry for forecasting, but to also list different types of forecasting—child or subordinate concepts—and the parent or superordinate concept. The J.D. 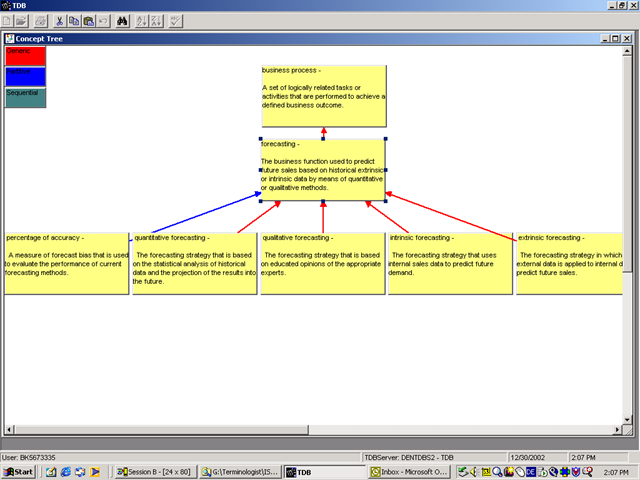 Edwards terminology tool, TDB, had an add-on that turned the data into visuals, such as the one below. It goes without saying that displays of this nature help, for instance, the Finnish terminologist to find equivalents more easily when s/he knows that besides qualitative forecasting there is also quantitative forecasting, etc. In his Manuel pratique de terminologie, Dubuc suggests that ad-hoc terminology work is a good way to get started with terminology management. Furthermore, he is right in that documenting concepts and their systems takes time and money, both of which are in short supply in many business environments. On the other hand, a more systematic approach will, in my experience, lead to entries that stand the test of time longer, create less downstream problems or questions, and need less maintenance. So, investing more time in the initial research and setting the surrounding concepts while you have the information at hand anyway, may very well pay off later. Seasoned terminologists know when to include terms to flesh out a system and when to simply answer an ad-hoc question. Yesterday’s example was the term ribbon. While the concept was an innovation at the time that is quite prevalent in software today, the term is not necessarily highly visible. Today’s focus will be on the term-selection criterion “visibility”—in other words, on terms that are conspicuous and prevalent. Did you find some highly visible terms there? All of them stand for ribbon tabs that are highly standardized to maximize user retention: One term representing the same concept in each of the different products makes it much easier for the user to remember where to find what. Do you think that this was a coordinated effort? I don’t know for sure, as my involvement with Office was limited to Office 2007, but it looks like it. That, too, is terminology management. Highly-visible terms must be correct in both the source and all target languages. Inconsistencies, spelling errors or variations are not only embarrassing, they lead to less trust by users, especially in markets with high-quality expectations. Terminology management working methods can spare you the embarrassment and lead to a trusting relationship with the users. In the posting for frequency and distribution, the focus was on automated term extraction output. Today’s criterion for term selection will pertain more often to manual term extraction. For consistency sake, we call it novelty to go along with all the other nouns (terminologization, specialization, confusability, frequency and distribution). But it simply refers to terms that are new and should be added to a terminology database for that reason. In the manual term extraction process a writer or editor documents terms while authoring material. They can do this either in a separate list or directly in the terminology database, depending on their working style, the need for immediate availability of the terms, their rights in the terminology tool, etc. Many of the terms documented this way will meet the criterion “novelty.” In a less strict sense of the word, novelties or “new terms” can also be the focus of a term extraction program. These programs can be set up to only extract terms that have not come up or been documented so far. The difference is that the human can evaluate right away which term really stands for an innovative concept, while the machine will only exclude what is already documented elsewhere. 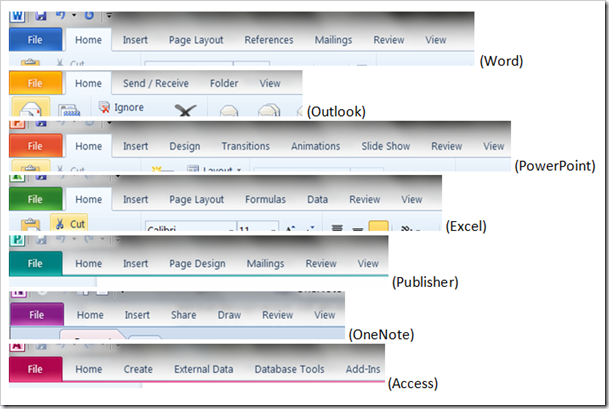 Most of us remember that with Office 2007 the ribbon was introduced. While the name of this new tabbed command bar does not show up in text all that often, it was new and would have been hard to name in other languages had it not been documented in a terminology entry. If the answer to the question “is this a new term representing a new concept?” is yes, do make an entry in the terminology database. Especially in environments where terminology management has been common practice and there is no need to document legacy terminology, most terms added to the database meet this criterion. Stay tuned for the posting on term selection and visibility.